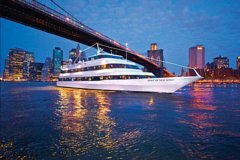 Get a totally different and exciting perspective on New York: from a fun dinner cruise that floats around New York Harbor and Manhattan offering stunning views of the city and some of the world's most famous landmarks, from the Statue of Liberty to the Brooklyn Bridge to the Empire State Building. Indulge in a delicious buffet dinner and then groove to the onboard DJ'ed music being spun. Make your way to Pier 61, where boarding begins at 6:30pm for a 7pm departure. After boarding the boat, explore the ship, then settle in for a lavish buffet dinner. While the menu is subject to change, it includes treats such as beef short ribs, roasted chicken, roasted salmon, and pasta, followed by desserts. After the meal, head topside to relax on the outdoor patio deck, which commands perfect views of Manhattan's skyline, including the Brooklyn Bridge, the Statue of Liberty, and One World Trade Center, one of the tallest buildings in North America. When you're ready to kick off the Christmas party, hit the dance floor to music from the ship's energetic DJ. This 3-hour cruise concludes at the original departure point.